End messy fruit and seed cleanup. 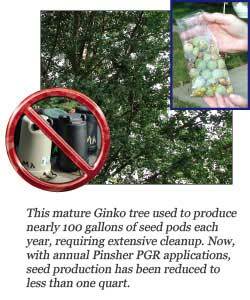 Pinscher PGR greatly reduces flowering and fruit/seed set without compromising tree health. Annual applications of Pinscher PGR will substantially reduce cleanup, maintenance labor, and associated costs. Use on ornamental trees with undesirable fruit or seed production that requires ongoing cleanup or causes turf maintenance problems. All sweet gum tree buds produce flowers immediately in spring when the buds emerge. 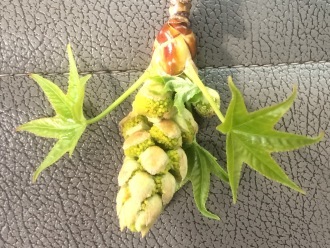 Below is a picture of a sweet gum tree bud after the tree has been treated for 2 seasons. It has no male or female flower. 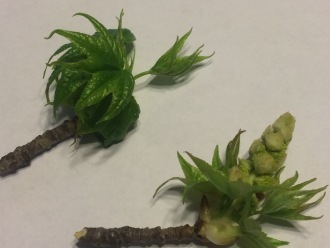 The bud on the right is what a typical sweet gum tree bud looks like with the leaves, male and female flowers present. Delivers proven results compared to foliage spray. 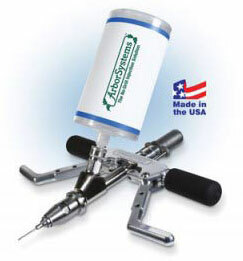 ArborSystems specially-designed Portle Tips and Tip Setter places the chemical into the active areas of conifers where it can be easily absorbed. A single application of Shepherd Fungicide provides protection (suppression) against Diplodia Tip Blight. Treatments can be made any time during the growing season including the fall. Treatments made during one year generally carry over to the following year, providing a minimum of 12 month preventative and curative protection. Click here for more information on Shepherd Fungicide. 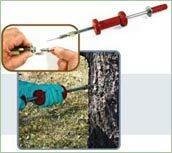 Reduce Pine Wilt risk One application of Greyhound Insecticide reduces Pine Wilt risk for up to 3 years. Treatments can be made during the Spring, Summer or Fall. Click here for more information and a research study conducted by University of Nebraska. Click here for more information on Greyhound Insecticide.